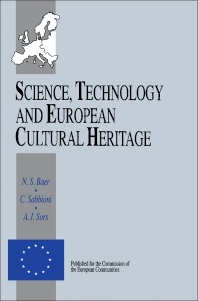 Science, Technology and European Cultural Heritage is a collection of papers from the Proceedings of the European Symposium of the same title held in Bologna, Italy on June13-16, 1989. The papers discuss the critical issues related to the scientific and technical aspects of the protection and conservation of the cultural heritage of Europe. Participants of the symposium identify and describe the main research and development issues that are common to cultural heritage problems, and increase cooperation in these areas. Other papers examine the applicability of research and development through better matching with the real needs of conservators, restorers, policy makers, and the general public. The participants also discuss specific research and development directions for the future, including the provision of a scientific basis for European Community policies on environment and culture. One paper presents some of the scientific research done both in the field and laboratory of specific historical areas, monuments, indoor objects. As an example, archaeologists can use infrared thermal image analysis as an enhanced tool to detect buried archeological and historical sites. Another paper analyzes the chemical and physical properties of deteriorated stones in historical monuments in Castile-Leon. The collection can prove useful for archaeologists, historians, museum curators, and policy makers involved in national and cultural preservation.